Dilly Khilawan stroked a patient 62 before Trinson Carmichael scalped 4 for 16 to ensure a 47 runs Liberty Sports Club (LSC) victory over Falcons Cricket Club (FCC). 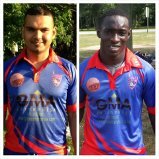 On a humid day in Bronx’s Van Courtland Park the GMA Enterprise sponsored LSC posted 179 for 9 batting first then returned to defend the chase, bowling out FCC for 132 in the 33rd over. On a heavy outfield where value for proper cricket shots was hard to come by The Blue Nation inched along at 46 without loss by the 12th over before Francis Mendonca (18) was left stranded after being called through for a single. Mendonca’s opening partner, Khilawan, would remain steady at the other end as he partnered Carmichael for another 42 runs before another unfortunate run out. Khilawan drove straight back and the outstretch hand of the bowler glanced the ball unto the non-striker’s stumps to find Carmichael (17) short of his ground. Khilawan kept on going in weather and playing conditions which made batting hard work. The right-hander struck three fours (3×4’s) and two sixes (2×6’s) in his 29 over innings. Skipper, Danesh Deonarain (14) and Terrence Madramootoo (1) had short stays at the crease with Khillawan before he too fell via the run out route. Altaaf Habibulla came in at number six (6) and batted well with the remaining batsmen. The diminutive left-hander carved out an unbeaten 34 hitting one four (1×4’s) and a six (1×6’s). Vijendra Singh (9) and Bose Persaud (13) shared a 12 and 45 runs partnership respectively with Habibulla to boost the total. Jason Rooney and Javed Shakoor fell quickly in the final over in an effort to get late runs. Sudesh Hemnauth picked up 2 wickets for 27 while Brahma Sanichar, Manoj Shamsundar and Akshay Homraj took a wicket each for Falcons CC before they limited LSC to 179 for 9. Having only 37 overs to chase the total due to a late start Falcons started briskly taking 23 off the first three (3) overs. Joining in what seem to be the order of the day after LSC suffered 4 run outs, Falcons lost their first wicket when Carmichael and Mendonca combined to catch Mohammed Zaheid (9) short of his ground. Tooneshwar Kristona would strike two (2) overs later to remove Manoj Shamsundar for 16. Jagdat “Bear” Hardeen had a brief stay at the crease before he cut Carmichael straight to Habibulla at backward point for 11. Denesh Harriprashad (24) and Zulfikar Ali (18) shared a 38 runs partnership before Vijendra Singh trapped Ali leg before. Singh would strike once again in his next over. Eighteen year old Javed Shakoor meanwhile was enjoying a favorable bowling debut for LSC in Eastern American Cricket Association (EACA) Power 40. Having sent down 3 overs for 13 runs during the Harriprashad and Ali partnership, Shakoor bowled Harriprashad in his fourth over after which he completed a maiden. The young right arm orthodox would go on to finish his 8 over spell with the a wicket maiden for 31 runs. Imran Khan (34) struck a few lusty blows to keep the Falcons camp hopeful but once introduced back into the attack, Carmichael wrapped up the victory for LSC. The Falcons CC inning ended at 132 all out in the 33rd over. Carmichael ended with figures of 6.2 overs 4 wickets for 16 runs. The LSC bowling was rounded off by Vijendra Singh 2 wickets for 26 runs off 5 overs and Kristona 1 wicket for 13 runs while Habibulla and Madramootoo bowled economically for 25 off 5 overs and 19 off 6 overs respectively but were unlucky to not pick up a wicket. The win takes #TheBlueNation to 8-1 in the EACA Power40 tournament as the Division 1 tournament continues. This entry was posted in Eastern American Cricket Association and tagged Altaf Habibulla, Dilly Khilawan, Falcons CC, Liberty SC, The Blue Nation, Trinson Carmichael. Bookmark the permalink.